1. Rub the steaks with the herbs and a little seasoning. Cut away the skin from the celeriac and shred the flesh in a food processor. (Alternatively slice the celeriac as thinly as possible and then cut across into very fine, matchstick-width pieces.) Place in a bowl and stir in the vinaigrette, followed by the mayonnaise, salad onions, capers, parsley and a little seasoning. 2. Heat the oil in a frying pan. Add the steaks and fry for 2 minutes on each side. This will leave the steaks pink in the centre. For well-done steaks allow 3-4 minutes per side. Spoon onto plates with the celeriac. You can use almost any other meat or even fish in this recipe. 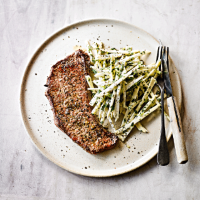 Remoulade is great with lamb, pork and sausages, or salmon and tuna steaks.